Boffy's Blog: Could The Slide in Oil Kill The Bond Market? Could The Slide in Oil Kill The Bond Market? In 2007, under the impact of the shutting in of oil production in the Gulf of Mexico, due to Hurricane Katrina, the price of Brent oil rose to $147 a barrel. It was the peak of what had been a steadily rising oil price. As usual, it caused the usual band of catastrophists – See, for example, Tony Clark's letter here – to declare that oil had virtually run out, that the price would continue to rise, and choke off economic growth, and bring civilisation as we know it to its knees. In other words, all the same Malthusian nonsense that Marxists have refuted from the time of Marx himself. In fact, as I pointed out at the time, the likelihood was that technology would develop to be able to both increase oil production, and to make its use more efficient. Both have happened, and rather than the oil price continuing to rise, it is falling sharply, now down to below $70 a barrel, and heading possibly for $40 per barrel. But, typical of the contradictions inherent in capitalism, this may have serious implications for financial markets. In 2008, I predicted, more accurately than anyone at the time, that the financial crisis was about to happen, and the scale on which it would occur – Severe Financial Warning. As can be seen from that post, the basis of the prediction was close study of what was happening in financial markets, on a daily basis, and an understanding, therefrom of the significance of the sharp drop in the oil futures market, which signified a severe tightening of the credit crunch, a search for liquidity, and forced sales of a range of financial assets to achieve it. The potential for the current moves in the oil market to spark a similar, and potentially much bigger, rout in financial markets, is different. It in fact, moves in the opposite direction. The rise in the price of oil, like the rise in the price of copper, and so on, after 1999, when the new long wave boom commenced, was entirely in line with what would be expected by long wave theory. But, equally, in line with basic Marxist and long wave theory, the response to those price rises, was equally predictable. It spurs innovation, and, after a certain point, new exploration, and investment in additional production. That, in turn, results in this new supply expanding, and, alongside a limitation of the expansion of demand, due to the introduction of other innovations that radically improve the efficiency of use of materials, energy etc., supply first matches, and then begins to exceed, global demand. Prices stabilise, and then eventually fall back. 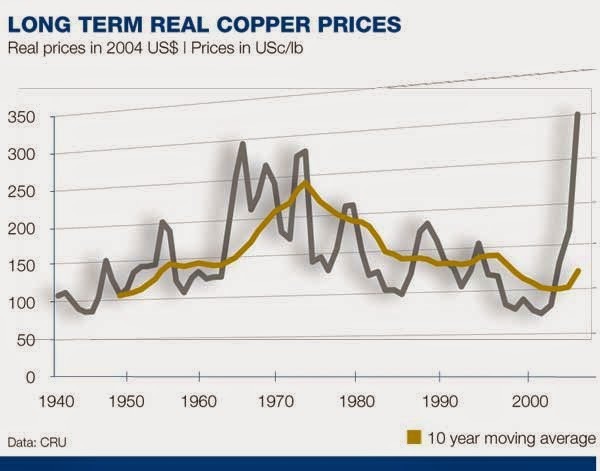 The four fold increase in the price of copper between 1999 and 2012, was entirely predictable, therefore, and consistent with identical moves during previous long wave cycles. The stabilisation of its price after 2012 was equally predictable. So, too was the ten fold increase in the price of oil and gold after 1999, and their recent stabilisation and then fall in price. As I've written previously, the use of innovation to increase the efficiency of use of oil has been going on for some time, which is why the rise in global GDP since the 1980's has been seven times the increase in global oil consumption during that same period. Consequently, even as China and other economies continue to grow rapidly, the effect, in terms of an increase in oil consumption, is only a fraction of what it was in previous decades. At the same time, other technological developments have meant that the potential to increase oil production by conventional drilling, as well as via fracking, have significantly increased oil and gas production, and other forms of fuel such as ethanol have been developed. That is without considering the gradual expansion of the use of hybrid engines, electric cars and so on. All of these factors, as I suggested several years ago, have come together both to constrain demand growth, and to increase supply, which has now caused the current slide in oil prices. When prices are high, it takes some time for producers, and potential producers, to be convinced to make the huge investments required to explore for new supplies, and to develop new mines, quarries, and oil and gas fields. They need to see that the higher prices are not just temporary, before they make these investments, and even then it takes time for that investment to result in new production and supply. This indeed is a part of the periodisation of the long wave cycle. But, equally, when these producers have invested these huge sums, often amounting to tens and hundreds of millions of dollars, in each new venture, the fact that this investment exists as a mass of fixed capital, that has already been sunk in the development, means that, when prices fall, they cannot simply shut down production, and wait for prices to rise again. In management accountancy theory, this is known as the contribution to fixed costs. That is that it is sometimes, and indeed often, rational to continue production, even if it results in losses. If total costs are taken into consideration, including the depreciation of fixed capital, production may be unprofitable. However, take out the depreciation of the fixed capital, and it may be possible that revenues exceed variable costs. In other words, there is a surplus on this basis, and this surplus can, thereby, make a contribution towards the fixed capital costs, which would not occur if production was stopped, or reduced. Given that, once invested, much of this fixed capital is not retrievable, for these kinds of companies, it becomes obvious why they will tend to continue to produce, even if that production is unprofitable, on a total costs basis. Much of the investment is not recoverable, because it entails things such as exploration costs, the drilling of test wells and so on, but additionally investment made in drilling holes, sinking shafts and so on cannot be sold on the market to some other mine owner, even heavy equipment is often not able to be sold at anything approaching its current value, if it is saleable at all. The only way all of this can be sold, is if the mine, quarry or oilfield itself is sold to some other capital, at a much reduced value. The result is that, due to this large scale, sunk fixed investment, production continues way beyond the point where it is unprofitable. Aware of these swings in the market, the companies involved in these industries, over long periods, tend to act accordingly. When market prices are high, and profits rise sharply, they make hay, and build up large cash reserves. Conversely, when prices fall sharply, and profits decline, they use those cash reserves to balance their position. Increasingly, they use the futures and other derivative markets as a means of achieving this too. But, that is also why we are now seeing the oil price continue to decline, and why those who expect it to reverse sharply back over $100 a barrel are likely to be disappointed. What we will see is a cessation of new exploration and development, not a cessation of existing production. But, that means that a whole series of smaller companies that were drawn into this production as a result of the high prices and profits, and who do not have the cash reserves, and balance sheet strength of the large companies, will go bust. This indeed, is the process that leads to the crisis of overproduction described by Marx in Capital III, Chapter 15, where a high and rising rate of profit causes over-accumulation of capital, and the over production of commodities. Given that many of these smaller companies have financed themselves by borrowing in the bond markets, this has significant consequences. Ten years ago, energy debt, the financing of such investment, via the US bond market, accounted for 4% of the US junk bond market. That is the part of the market that involves the purchase of bonds with much higher yields, but a higher risk of default than investment grade bonds. Today, it accounts for 16% of that market, and as financial repression has caused bond investors to continually search for yield, by moving increasingly into these higher risk bonds, so their prices have risen, and the yield on those bonds has fallen. We now have a situation where there are vast quantities of these junk bonds in existence, with investors in them who have treated them as though they were investment grade, on the basis of low risk of default, who now face the potential for large scale defaults by energy companies, who find that they are making huge losses, as the price of oil and gas drops sharply. Already, the price of these junk bonds has begun to fall sharply, pushing their yields higher, and consequently making it much more expensive for these companies to undertake further borrowing. This becomes a situation like that described by Marx in Capital III, where the rate of interest rises sharply, not because there is a strong demand for money-capital to invest, but because distressed companies, desperately need money simply to stay afloat, to meet their current payments. About a third of this energy debt is already classified as “distressed”, and likely to default. Deutsche Bank in a recent report stated that this could be the spark for a new round of defaults. Moreover, as I set out a while ago, the nature of junk bonds, means that they are highly illiquid. When they begin to sell off, because there is not a large market for their purchase, the prices often drop precipitously, as sellers are unable to find buyers. But, as I pointed out in 2008, ahead of the financial meltdown, when such defaults arise, within the financial markets, the effect can spread like wildfire, with unpredictable consequences. In a global financial market where these junk bonds themselves are used as collateral by financial institutions, and stand behind unknown layers of fictitious capital, stretching back to the global banks and financial institutions themselves, a series of defaults by these energy producers, result in defaults on junk bonds, which causes a subsequent much larger default on derivatives into which those junk bonds have been bundled, or for which they stand as collateral. As with 2008, what we then have is a collapse of those major financial institutions, a renewed credit crunch, a sharp rise in bond yields, and a consequent effect on other financial and property markets. 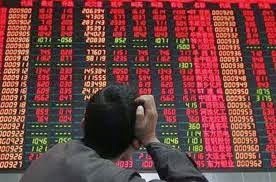 If there is a series of defaults of energy companies due to the fall in the oil price, and the lower it falls, the more higher cost producers, such as those involved in deep sea production, fracking etc., will find themselves in that position, the chance of such a collapse of these junk bonds increases, and given the illiquid nature of that market, the collapse could be spectacular. But, oil and oil derivatives are themselves used extensively as collateral by financial institutions and others. As happened in 2008, with the collapse in property prices, a sharp drop in the value of collateral undermines the loans made upon it. Banks holding that collateral must then recapitalise, in an environment of falling bond prices and rising interest rates. At the moment, we have what appears to be an almost bizarre situation at first glance, of bond yields for a number of states, with huge levels of debt – Japan, US, UK, and even Spain, Portugal and Italy – that are ridiculously low. In fact, contrary to Osborne's claim in the Autumn Statement that its confidence in their financial management that explain the UK's low gilt yields, the credit rating agencies have withdrawn the UK's AAA rating, and Spain and Italy's 10 Year Bond Yields are as low or lower than those of the UK. But, this situation is quite explicable, and the underlying situation is dangerous. For the last 30 years, a high and sharply rising global rate of profit, created a surplus of loanable money-capital, which, as Marx describes, in his explanation of the interest rate and business cycle, leads to falling interest rates. But, again, consistent with that explanation, and with long wave theory, the conditions which created that situation have begun to reverse. From around 2012, global interest rates have started to rise. That seems incompatible with the current bond yields in the above countries. The explanation cannot be money-printing by central banks, which creates only more money tokens, not more money-capital. The explanation can be found by looking at the fact that bond yields for a range of other countries, like Russia, Turkey, Brazil, South Africa and so on, have been rising sharply. Similarly, where official interest rates, in the US and UK, are at 0.5%, in Russia and Turkey they are at 12%. Once this is considered, the reason for the low bond yields in the US, UK and Eurozone becomes explicable. One is simply the consequence of the other. During the period of Q.E, the BRIC and other developing economies, saw their currencies rise, as increased money printing, in the US and elsewhere, resulted in those dollars flowing into these developing economies, as they engaged in productive investment. Higher currencies also resulted in lower imported inflation, and consequently lower interest rates. When the US began to taper its QE programme, this process reversed. The dollar started to rise against these other currencies, and as most global trade is denominated in dollars, this meant that these countries faced rising imported inflation. To meet it, and to defend their currencies they raised official interest rates, and saw the markets sell off their bonds, causing yields to rise. In short, money flowed out of these economies, and into the US, and other economies where risk of default was seen as lower, in part because ultimately those economies have large amounts of accumulated wealth, as well as central banks that can, if necessary, begin to engage once more in QE, to buy up bonds. But, sooner or later, the currencies of Russia, Brazil etc. fall to a point where they are cheap relative to the dollar, sterling, euro etc. Moreover, there comes a point where the interest rates in these former economies become so alluring, compared to the prospect of earning just 2% p.a. for lending your money to the US or UK for ten years. At that point, the bonds of the latter start to get sold off, and the proceeds go into buying the bonds of the former. That is especially the case as the potential for currency appreciation, then means that besides a higher yield on the bonds, there is also the potential for a capital gain, resulting from a higher currency. US, UK and Euro bonds, then sell off rapidly with a consequent sharp rise in US, UK and Euro interest rates. That is all the more likely in the context of a sharp sell off of junk bonds, sparked by defaults by energy companies following the fall in oil prices. But, this has further consequences. As interest rates rise, following this sell off of bonds, this causes a fall in equity prices. If its possible to earn a 5% yield on relatively safe 10 Year US or UK government bonds, why would you invest your money in the shares of US and UK companies that only provide a similar dividend yield? Neither the US nor UK states are going to go bust, so you will ultimately not lose your money if you buy their bonds. But, even huge companies like GM have gone bust, and you would then lose your money invested in their shares. For taking that risk, you will demand a higher rate of return than on government bonds. The consequence is that share prices fall to a level where they bring a suitably higher dividend yield. The more bonds sell off, and bond yields rise, the more shares sell off. But, shares also comprise a significant element of collateral on bank balance sheets. As share prices fall, so the banks' capital declines, and they need either to rein in their lending or to raise additional capital, by issuing shares, or bonds to do so. They do so in conditions where shares and bonds are already selling off, and where they need, therefore, to issue more shares or bonds to raise any given amount of capital. In doing so they contribute further to the over supply of bonds and shares into the market, causing their prices to fall even further. But, this increase in interest rates means that the astronomical bubble in property prices in the UK that is only sustained by low interest rates, a policy of “extend and pretend” by banks, to disguise the existing level of defaults, and repeated market manipulation by the state, will collapse in a way that will be as unprecedented as is the current size of that bubble. The consequence of that for the banks, not just UK banks, but global banks that are tied to them through the global financial system, will be catastrophic. Indeed, its because of that consequence that all the stops have already been pulled out to prevent that property price collapse, that I expect to be between 70-90% from current levels. But, its not just in the UK. US property prices have risen sharply again in the last couple of years, driven by speculators rather than homebuyers. In fact, it appears that as in the UK, most potential homebuyers in the US, are once again finding that prices are too high for them to buy. As I reported recently, a large proportion of new mortgages in the US, are not to buy homes, but are remortgages, of existing homeowners seeking once again to use their homes as ATM's, and thereby putting that ownership at risk. A similar situation exists in parts of Ireland, particularly around Dublin. Property prices continue to fall in Spain and other parts of the periphery, yet considered on a longer term, historical basis, despite falls of around 50-60%, these prices continue to be extremely elevated. A further financial crisis will undoubtedly see those property prices fall further. As I point out in my book, Marx and Engels Theories of Crisis: Understanding The Coming Storm, this is inevitable in the not too distant future. The only question is what the spark is that ignites the conflagration. The fall in the oil price, which might otherwise be seen as highly beneficial – and undoubtedly is for the real economy – may ironically be that spark. Why Should We Subsidise London From Our Taxes?